Zion Market Research has published a new report titled “Cable Television Networks Market by Direct Broadcast Satellite Services (DBS), Satellite Master Antenna Systems Services (SMATV), Multipoint Distribution System Services (MDS), Closed Circuit Television Circuits, Subscription Channel Services, Cable and Other Pay Television Services, by Region (North America, Europe, Asia Pacific, Latin America and Middle East and Africa): Global Industry Perspective, Comprehensive Analysis, and Forecast 2016-2022’’. 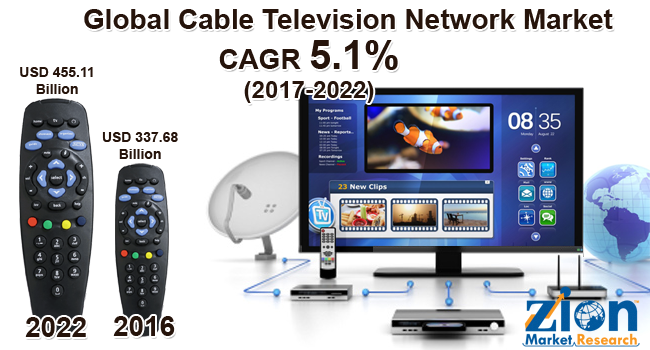 According to the report, global cable television network market was valued at around USD 337.68 Billion in 2016 and is expected to reach approximately USD 455.11 Billion in 2022, growing at a CAGR of slightly above 5.1% between 2017 and 2022. In this era of digitization, delivering television programming services to all subscribers is carried out by cable television operators. The Radio Frequency (RF) signals are transmitted in the form of light pulses through optical fiber cables and coaxial cables. In traditional broadcast television, the television receives signals through TV antennas which are transmitted in the form of radio waves. However, in DBS (Direct Broadcast Satellite), the signals are transmitted from a satellite and are received by the receiver which is connected to the television via cable. Hence, cable television network market is expected to grow significantly during the forecast period. The major factor transforming the cable network market is increasing population, thereby increasing the consumer base, satellite television broadcasting, paid TV channels, and accessibility to high-quality digital content. Cable television is considered to be among the easily available and affordable sources of entertainment and information in our day to day life. The cable service providers offer various services such as broadcasting popular TV shows, movies-on-demand, news, sports, etc. Rising living standards of people have been generating demands for various sources of leisure & entertainment, and cable TV network is considered as one of the optimal sources. With the introduction of high-definition (HD) and digital channels, the demand for cable TV network is anticipated to witness significant growth during the forecast period. The industry is expecting a significant amount of investments due to the technological advancements that have led to the demand for enhanced content quality and smooth delivery of network programs to subscriber’s premises. Tencent Holdings, China’s largest social media and gaming company, agreed to feature its video content on the smart TVs of China’s biggest television maker TCL Corp to expand its content dominance from mobile phones to living rooms. Paid TV channels have been garnering high response globally and that is one of the major restraining factors in cable TV advertisement. The high subscription cost for HD (high-definition) channels is another restraint that is expected to hinder the growth of cable television network market. Whereas it struggles to receive signals due to rain and bad weather which affects the efficiency of the network. The cable television network is continuously expanding with new and improved technological implementations which are expected to create ample growth opportunities in cable television network market. The segmentation of cable television networks market includes Direct Broadcast Satellite services (DBS), Satellite Master Antenna Systems Services (SMATV), Multipoint Distribution Systems services (MDS), cable and other pay services, closed-circuit television circuits and subscription television services. On a regional basis, the segmentation includes North America, South America, Europe, Asia Pacific, Latin America and the Middle East and Africa. The key players operating in the cable television network market are Time Warner Cable Inc., Discovery channel, ESPN, CNN, Cox Enterprises, Comcast corp., Vivindi SA, Liberty Media Corp, and Viacom Inc. among others.